In 1917 Martin J. Gruber (1877-1956) and Benjamin J. Docherty (1885-1926) built a lumber mill just south of the present (1999) town of Rainier WA. Gruber, born in Oshkosh, WI had come west with his family in 1890. His father had built a store in Winlock WA and after some college, Gruber returned as a licensed pharmacist to work with his father in the store. When the store burned in December 1911, Gruber worked for a short time with C.A. Doty (Doty was married to Gruber’s sister, Wihelmine) at the Doty Lumber Co., Doty, WA. 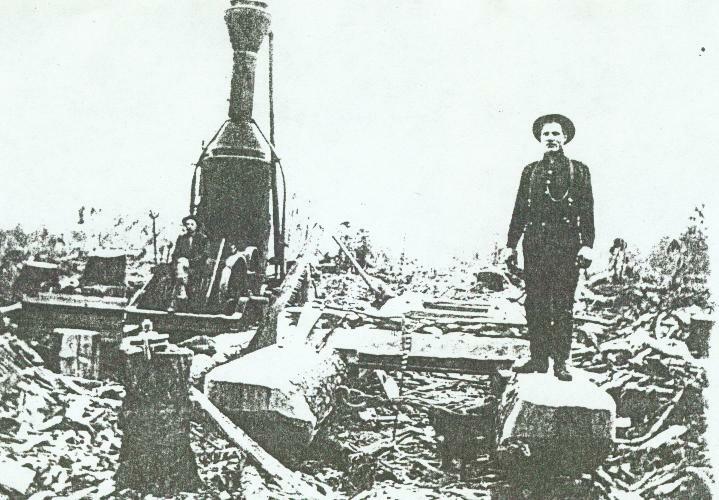 Later he went to work at the Heybrook Lumber Co., Heybrook, Snohomish County. Benjamin J. Docherty was born in Grindstone City, MI, but grew up in Iron River (near Ashland) WI. He came west to Winlock with his employer (as a logger) Michael T. 0’Connell. Docherty was married to Gruber’s sister, Amalia (Molly). The Rainier mill burned in 1927. During the Great Depression of the 1930’s, the site was used for the location of the Civilian Conservation Corps’ Camp Rainier. After the 1927 fire, Gruber and Docherty bought the Harstad Brother’s Mill in Yelm. The Harstads had built the mill (probably about 1920) just south of Yelm on what was known as McKenzie Lake. Two fires (1931 and 1936) coupled with the depression and labor unrest of the time caused the firm to “go under” in 1937. When Gruber and Docherty could not meet their payroll, H. L. Wolf & Co.(merchants in Roy and Yelm) cashed their workers’ pay checks–as early as 1935. Docherty had developed heart trouble before he was 50. He died in 1942. Gruber later went into politics and at the time of his death in 1956 was Thurston County Treasurer.